Everyone's talking about big data – getting our arms around it and putting it to work for us. 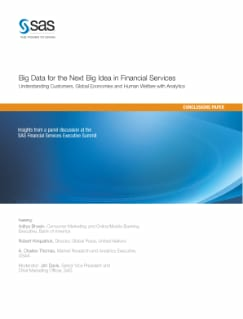 This paper summarizes a panel discussion at the 2012 SAS Financial Services Executive Summit where industry leaders shared their ideas about big data and what their organizations are doing with it. Aditya Bhasin from Bank of America talked about how to extract more value from the data you already have, even if it's just a fraction of what's out there. Robert Kirkpatrick, who leads the UN Global Pulse initiative, talked about how data can help us better understand global economies and human welfare. Charles Thomas, a market research and analytics executive at USAA, described how his company is navigating the shift to more real-time and predictive analysis.